This summer has been a revolving door of visitors at our house and we’ve loved it! We’ve seen folks we haven’t seen in thirty years and caught up. Plus we’ve gotten to spend time with family. There has been, however, a surprise and frequent visitor recently. It’s that time of year in the forest. Black bears, who are actually brown or cinnamon colored, are feeding up for the long winter hibernation. A bear’s natural wariness to find food overrides his fear of humans and his nose is one hundred times more sensitive than ours. 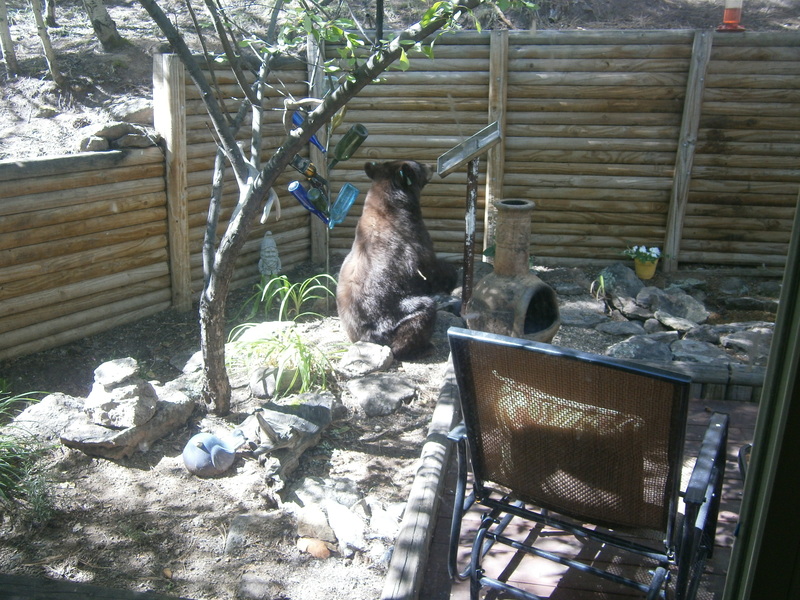 Bird and hummingbird feeders provide as much as twelve hundred calories so the bears prowl around looking for easy food. 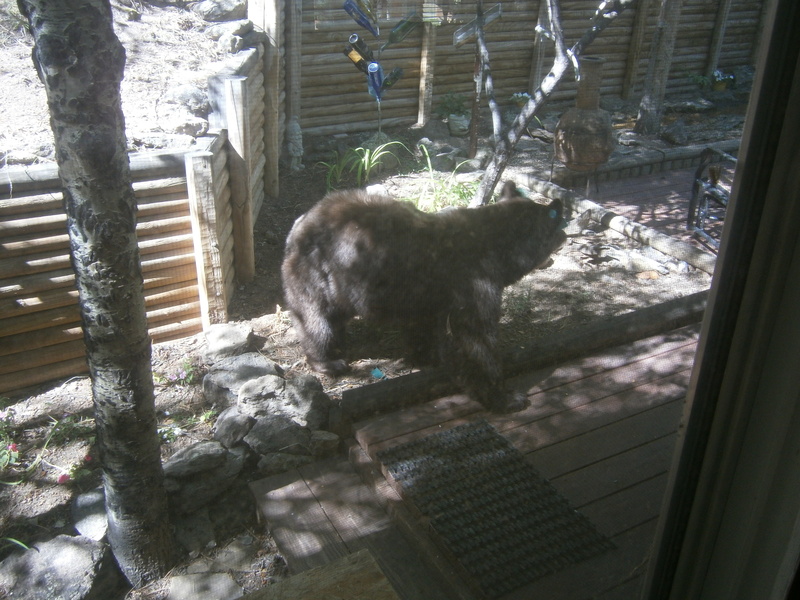 We do our part to keep the bears wild by bearproofing our house, which means we take our bird feeders in at night. 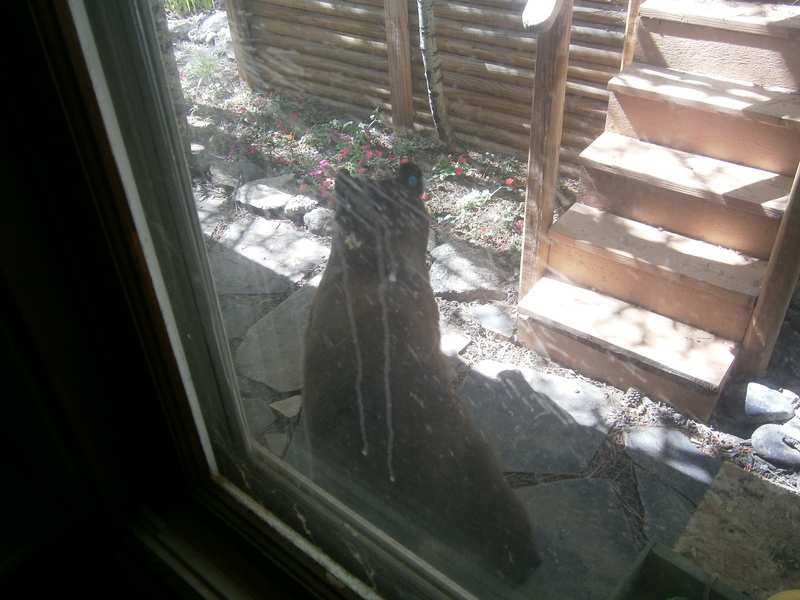 Only, our visitor came mid-morning! 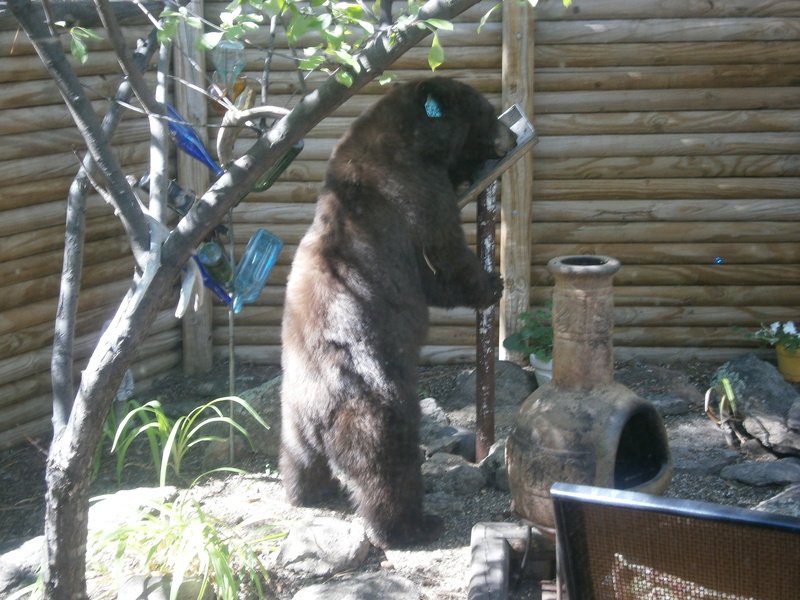 On his first visit, Buddy Bear, as my sister named him, emptied our homemade feeder, and ignored the hummingbird feeder hanging ten feet above his head according to the bearproofing pamphlet instructions. It was too high for him to reach. Finished, Buddy sat a spell before he moseyed off. Buddy returned for a second sniff and, finding none, wandered off again. Next day he came again. 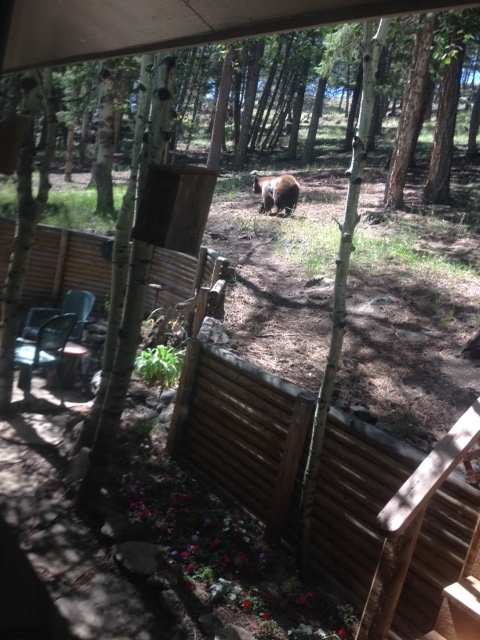 This time sniffing no food, he sauntered up to the rock outcropping above our house. 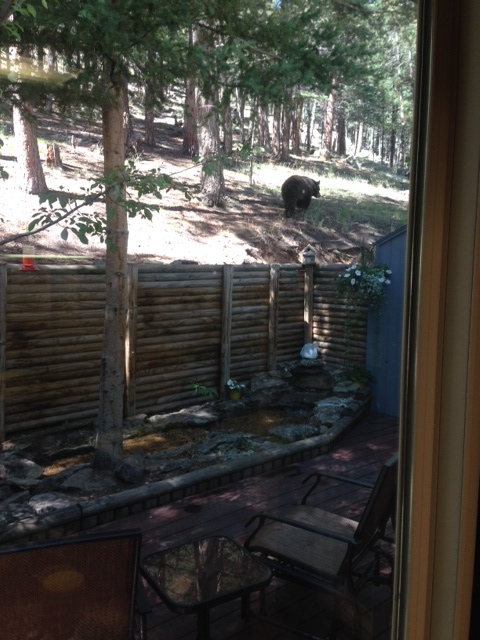 We watched him from the large dining room window. He watched us. We wondered if he thought we were in a people zoo. Eventually he traveled on. But Buddy returned a third day. Finding the feeder gone. He decided to take a rest up next to the house. That was when my husband decided that Buddy was becoming too friendly and used one of our forest ranger provided firecrackers. The loud bang sent Buddy scurrying away. We’re hoping that the firecracker did its job. If you look closely, you’ll noticed that Buddy has tags on both his ears. He’d been a very bad boy. 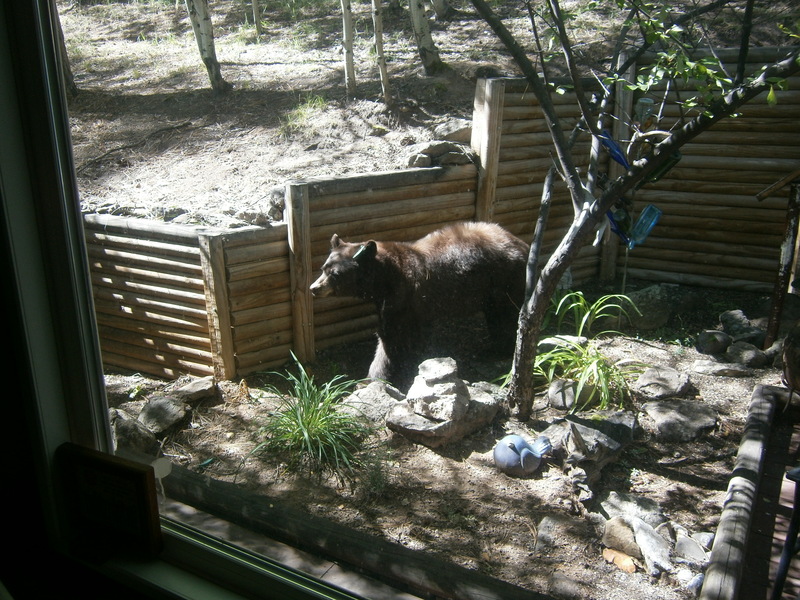 A bear is tagged and relocated from an area where he’s done some damage or been a threat to humans. Bears only get two chances. Third time the animal is destroyed. We don’t want that to happen. They lived in this place first and we’re willing to share unless the visitor is very, very bad. 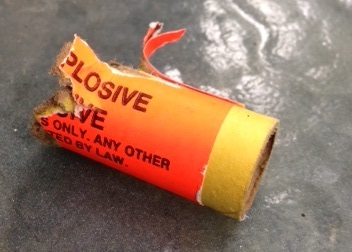 Btw, we never use firecrackers on our human house guests — even if they are very, very bad.